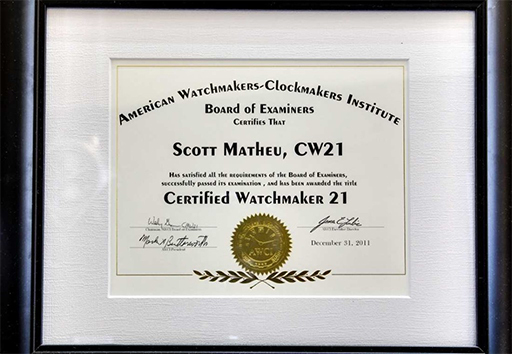 Matheu’s has CW21 Certified Watch Makers & OWME 1120 Certified. Matheu’s has been offering watch repair and service since 1951. We are Cartier, Tag Heuer, Phillip Stein, Victorinox Swiss Army, and Trained and Certified Factory Authorized Service Provider. Your watch is an important and valuable possession and its proper repair and restoration is of upmost importance to Matheu’s. A qualified watchmaker is the only one that should be entrusted to perform repair or service work on the precise and delicate parts and operation inside your watch. Matheu’s Fine Watches & Jewelry has CW21 Certified Watchmakers on their watch repair and service staff at our Highlands Ranch CO store. 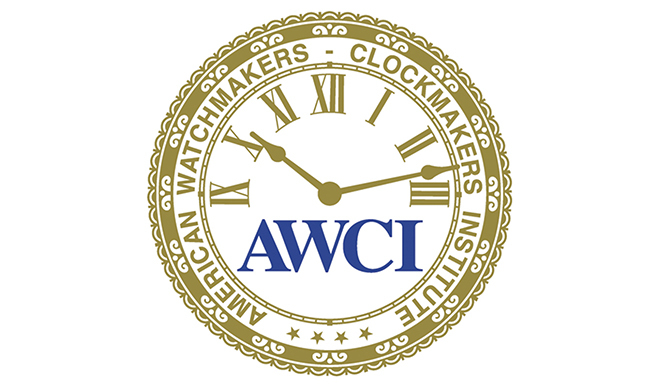 The American Watchmakers-Clockmakers Institute (AWCI) in conjunction with the leading Swiss watch brands (Breitling, Omega, Rolex, and others) has created the CW21 Certification for watchmakers. This certification has the most stringent standards for watchmakers performing repair, restoration, and service work on watches. If you are considering getting your valuable timepiece repaired or restored, because of our CW21 Certification, you can be assured that Matheu’s Fine Watches & Jewelry will provide you with the highest quality level of watch repair and service. Our CW21 Certification ensures that we possess the superior skills and knowledge for servicing quality watches. Matheu’s possesses an OWME 1120 Certification from Omega. Your luxury watch is an investment in addition to being a fine piece of jewelry. Have confidence that your luxury Omega watch will receive the highest level of care at Matheu’s. The certifications require untold hours of class work to acquire the qualifications to be an approved service provider for brands such as Omega. The certification includes more than just proficiency exams, other requirements include thesis work, projects, and examples of repair on the highest quality time pieces in the world.